The objective of this study was to analyse the reproductive performance of hybrid (Yorkshire x Landrace) gilts/sows in relation to temperature-humidity index (THI) at artificial insemination (AI), season of AI, occurrence of estrus >8 d post-weaning, repeated estrus, insemination technique (cervical, CAI or post-cervical, PCAI) and parity. Data included 8851 reproductive records (1771 for gilts and 7080 for sows) from a pig farm in a sub-tropical zone (THI ranged from 72.9 in January to 81.8 in June). A decrease in pregnancy rate (PR, 89.8 vs 93.0%; P<0.01) and a tendency to decline farrowing rate (FR, 87.9 vs 90.3%; P=0.07) following AI during high THI (>82), compared to AI at <74 THI were observed. The spring and summer season were associated with decreased (P<0.01) PR compared with fall and winter (90.0% vs 93.0%). Likewise, FR decreased in spring and summer compared to fall and winter (88.5% vs. 90.9%). FR was higher (P<0.01) in non-repeat breeders compared with that of repeat-breeders (90.3% vs 76.2%). Litter size increased (P<0.01) from 10.8 ± 3.2 to 11.1 ± 3.1 pigs when the interval from weaning to estrus was >8 d. The insemination technique did not affect PR and FR but the litter size decreased (P<0.05) from 11.3 ± 3.0 to 11.1 ± 2.9 pigs when PCAI was used compared to CAI. This study reaffirms the negative effects of the hot season on reproductive performance of gilts/sows, although thermal stress at AI did not cause foetal losses. Also, there is no advantage in using the PCAI as compared to the CAI in gilts/sows with high numbers of sperm cells per AI. MELLADO, Miguel et al. Effect of climate and insemination technique on reproductive performance of gilts and sows in a subtropical zone of Mexico. 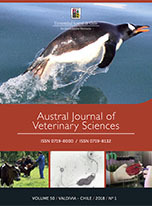 Austral Journal of Veterinary Sciences, [S.l. ], v. 50, n. 1, p. 27-34, jan. 2018. ISSN 0719-8132. Disponible en: <http://revistas.uach.cl/index.php/australjvs/article/view/1213>. Fecha de acceso: 22 apr. 2019 doi: https://doi.org/10.4067/S0719-81322018000100106.